Today, more and more restaurants have started replacing traditional static signs with digital menu boards. It is not difficult to understand why. Digital signs solve the problems that standard backlit boards face with space and item changes. Digital menu boards also help in creating improved branding and visual impact with efficient use of technology and space. Ryarc provides complete solution for managing digital menu boards helping customers to manage a single screen in a stand-alone store or an enterprise rollout with thousands of screens spread across different locations. With its easy to use interface, customer can easily update menu board content as and when required. CampaignManager supports scheduled as well as on demand content and is also capable of driving time based and dynamic content by means of XML driven menu templates, dynamic pricing updates to the menu boards, or even link menu board items and prices to POS systems if required. For locations with no network or unreliable networks, CampaignManager’s offline USB update feature is of great advantage to clients. CampaignManager also allows interactivity between mobile devices and menu board screens allowing customers to choose the content they want to see or download offers, menus etc. on their phone or TAB. CampaignManager supports both Windows and Android devices and is available in cloud as well as on premise options. Ryarc CampaignManager is used by some of the leading restaurant chains to manage their menu boards. If you are planning to deploy digital menu boards or need to upgrade your current solution, please get in touch with our Digital Signage Expert for a free consultation, Demo, Trial licenses and special price offers. 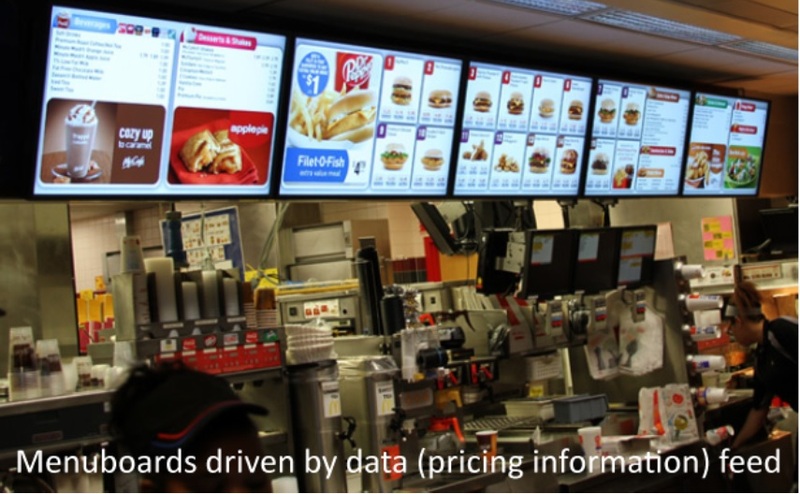 Is content to digital menu screens managed centrally or by local store or a mix of both?